Indian cuisines have always welcomed the best of varieties and multiple hues of tastes. If North boasts of the flavours of Dal Makhani and Paneer tikka, we have the entire South offering exquisite delicacies like Chicken Chettinad and Dosa, Vada or Idlis. But it is often a misconception that Southern India is only restricted to the aforementioned delicacies and Peninsular Kitchen is all set to prove it. 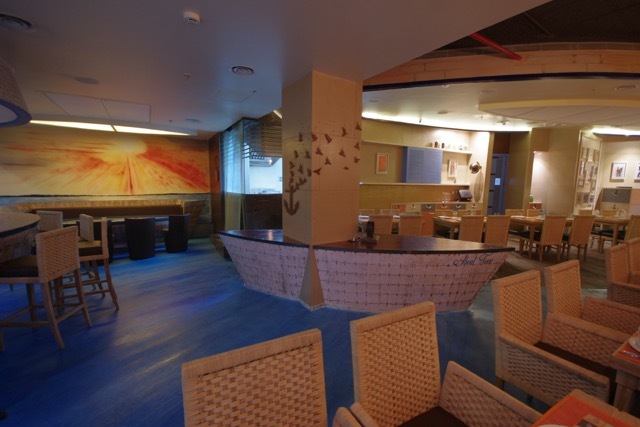 Situated in Vasant Kunj Ambience Mall, this joint is truly a foodie experience of the Peninsular flavours. Our foodie journey will surely make you believe that to the core. If you are wondering Peninsular Kitchen is a similar representation of only Dosai and Idlis, it’s time to shake your notions. It is indeed an authentic platter of dishes covering the entire Peninsular. Beginning from the ambience that has paintings and arte-facts with the Peninsular flavours, you also have the extraordinary names of dishes and the variety of delicacies to offer you the best shot of Peninsular tastes. By claiming itself to be a Peninsular themed restaurant, it truly welcomes delicacies from the states of Goa, Kerala, Tamil Nadu and Andhra. Our foodie journey started with some sizzling mock tails devised with the Punch of some super delicious Southern flavours. Our mock tail appetites were taken good care of by ‘The Coconut Mojito ‘and the’ Aam Panna Lassi’, both loyally imparting the superb polished aromas of the Peninsular lands. The later though was simple in presentation and ingredients, but it was enriched with the goodness of authentic in house Aam Panna with yoghurt and rock salt. Coconut Mojito deserves an exclusive explanation since we loved it to the core. With fresh mint leaves, coconut syrup as well as some chunks of lime this mocktail redefines the flavours of the coast. Peninsular Kitchen has to its treasure trove the best of appetizers to make you a true foodie and fall in love with the food. We started our experience with the “Tala Hua Gosht”, a pure Hyderabadi dish, oozing out with the authentic spices of Hyderabad from every bite. The mutton was soft and well-cooked making us fall in love with the peninsular chefs again and again. For our Mangalorean appetites we found a starter companion in the menu, the Mangalorean Squids Fry. This was a spicy version of squids with some mix of mustard seeds, chillies with a tangy twist through some lemon juice. Now coming to the main course, the list is long and indeed every dish deserves a separate token of appreciation. However to name a few, we had the Jhinge Ka Korma, an awesome delicacy from the Chef’s kitchen, a spicy gravy based on Prawns and some soft and mouth-melting Neer Dosais. One should also try The Kodi Pulao, a savoury Andhra themed Pulao or the Tahari , a minced mutton Pulao with a zingy taste. Our meal concluded with the super pampering Bibinca, a true Goan dessert. Why Peninsular Kitchen Stands Out to Be the Best Shot among all Southern Cuisine joints in Delhi? The love for food has made us explore a huge number of delicacies. But Peninsular Kitchen stands to its promise. All its Chefs being from the Southern Part of India know their jobs well and thus deliver absolute authenticity to the dishes. And when a brain and a dedicated heart like Mr. Gaurav Goel lies behind such a restaurant, the outcome is indeed stupendous like Peninsular Kitchen.